Mineralogy is a subject of geology specializing in the scientific study of chemistry, crystal structure, and physical (including optical) properties of minerals. Specific studies within mineralogy include the processes of mineral origin and formation, classification of minerals, their geographical distribution, as well as their utilization. Early writing on mineralogy, especially on gemstones, comes from ancient De re metallica (On Metals, 1556) and De Natura Fossilium (On the Nature of Rocks, 1546) which begin the scientific approach to the subject. 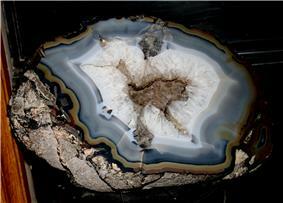 Systematic scientific studies of minerals and rocks developed in post-Renaissance Europe. The modern study of mineralogy was founded on the principles of crystallography (the origins of geometric crystallography, itself, can be traced back to the mineralogy practiced in the eighteenth and nineteenth centuries) and to the microscopic study of rock sections with the invention of the microscope in the 17th century. 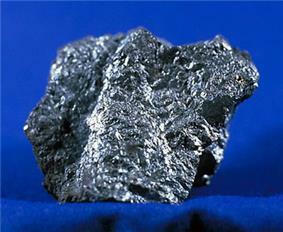 Chalcocite, a copper ore mineral. 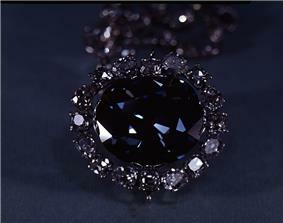 Historically, mineralogy was heavily concerned with 4,000 species of mineral recognized by the IMA. Of these, perhaps 150 can be called "common," another 50 are "occasional," and the rest are "rare" to "extremely rare." More recently, driven by advances in experimental technique (such as solid-state physics. It, however, retains a focus on the crystal structures commonly encountered in rock-forming minerals (such as the perovskites, clay minerals and framework silicates). In particular, the field has made great advances in the understanding of the relationship between the atomic-scale structure of minerals and their function; in nature, prominent examples would be accurate measurement and prediction of the elastic properties of minerals, which has led to new insight into seismological behaviour of rocks and depth-related discontinuities in seismograms of the Earth's mantle. To this end, in their focus on the connection between atomic-scale phenomena and macroscopic properties, the mineral sciences (as they are now commonly known) display perhaps more of an overlap with materials science than any other discipline. Chemical mineralogy focuses on the chemical composition of minerals in order to identify, classify, and categorize them, as well as a means to find beneficial uses from them. There are a few minerals which are classified as whole elements, including sulfur, copper, silver, and gold, yet the vast majority of minerals are chemical compounds, some more complex than others. In terms of major chemical divisions of minerals, most are placed within the isomorphous groups, which are based on analogous chemical composition and similar crystal forms. A good example of isomorphism classification would be the calcite group, containing the minerals calcite, magnesite, siderite, rhodochrosite, and smithsonite. Biomineralogy is a cross-over field between mineralogy, paleontology and biology. It is the study of how plants and animals stabilize minerals under biological control, and the sequencing of mineral replacement of those minerals after deposition. 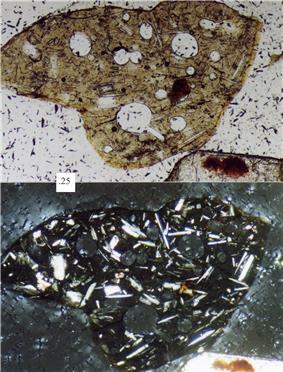 It uses techniques from chemical mineralogy, especially isotopic studies, to determine such things as growth forms in living plants and animals as well as things like the original mineral content of fossils. Optical mineralogy is a specific focus of mineralogy that applies sources of light as a means to identify and classify minerals. All minerals which are not part of the cubic system are double refracting, where ordinary light passing through them is broken up into two plane polarized rays that travel at different velocities and refracted at different angles. Mineral substances belonging to the cubic system contain only one index of refraction. Hexagonal and tetragonal mineral substances have two indices, while orthorhombic, monoclinic, and triclinic substances have three indices of refraction. 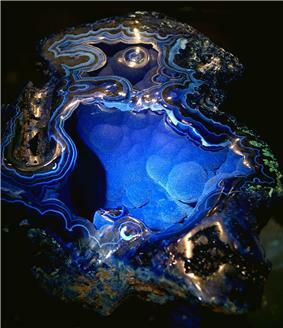 With opaque ore minerals, reflected light from a microscope is needed for identification. X-rays are used to determine the atomic arrangements of minerals and so to identify and classify them. 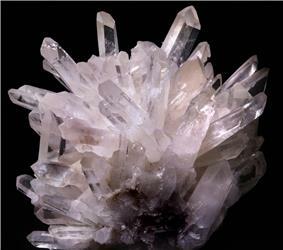 The arrangements of atoms define the crystal structures of the minerals. 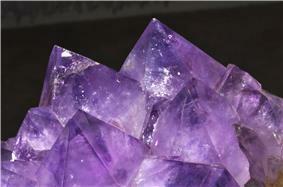 Some very fine-grained minerals, such as clays, commonly can be identified most readily by their crystal structures. The structure of a mineral also offers a precise way of establishing isomorphism. With knowledge of atomic arrangements and compositions, one may deduce why minerals have specific physical properties, and one may calculate how those properties change with pressure and temperature. The environments of mineral formation and growth are highly varied, ranging from slow crystallization at the high temperatures and pressures of igneous melts deep within the Earth's crust to the low temperature precipitation from a saline brine at the Earth's surface. 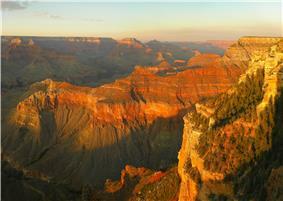 formation by oxidation and weathering of rocks exposed to the atmosphere or within the soil environment. Determinative mineralogy is the actual scientific process of identifying minerals, through data gathering and conclusion. When new minerals are discovered, a standard procedure of scientific analysis is followed, including measures to identify a mineral's formula, its crystallographic data, its optical data, as well as the general physical attributes determined and listed. Minerals are essential to various needs within human society, such as minerals used as ores for essential components of metal products used in various commodities and machinery, essential components to building materials such as limestone, marble, granite, gravel, glass, plaster, cement, etc. Minerals are also used in fertilizers to enrich the growth of agricultural crops. Mineral collecting is also a recreational study and collection hobby, with clubs and societies representing the field. Museums, such as the Smithsonian National Museum of Natural History Hall of Geology, Gems, and Minerals, the Natural History Museum of Los Angeles County, the Natural History Museum, London, and the private Mim Mineral Museum in Beirut, Lebanon, have popular collections of mineral specimens on permanent display. List of minerals - a simple list concentrating on minerals with WorldHeritage articles. List of minerals (complete) - a more complete list of IMA-approved minerals, regularly updated. ^ a b c Needham, Joseph (1959). Science and civilisation in China. (Reprinted ed.). Cambridge [etc. ]: Cambridge University Press. pp. 637–638. ^ Christoffersen, M.R., Balic-Zunic, T., Pehrson, S., Christoffersen, J. (2001) "Kinetics of Growth of Columnar Triclinic Calcium Pyrophosphate Dihydrate Crystals" Crystal Growth & Design 1(6): pp. 463-466. ^ "Collector's Corner". The Mineralogical Society of America. Retrieved 2010-05-22. ^ "The American Federation of Mineral Societies". Retrieved 2010-05-22. 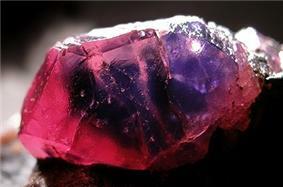 ^ "Gems and Minerals". Natural History Museum of Los Angeles. Retrieved 2010-05-22. Ramsdell, Lewis S. (1963). "".